An eminently readable book, this examination of the poppy’s contribution to humankind, for both good and ill, belongs on every shelf. Written in a beguiling, conversational tone that kept this reader reading late into the night, the book looks at the history of the poppy and its psychoactive products, the sacred and mystical elements surrounding the plant and its effects on the mind, and the terrible toll that it takes on those addicted to such derivatives as codeine, morphine, and heroin. 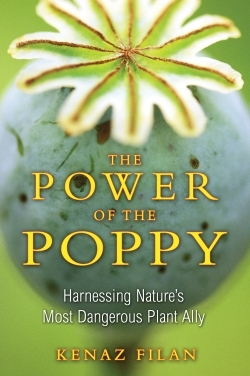 But it also examines the benefits that the poppy’s sap can have for those in pain, both mental and physical, and suggests that perhaps in the US there has been an overreaction to what it argues is not necessarily a moral failing (drug addiction) but a genuine physical and psychological dependence on the poppy’s products. Kenaz Filan not only delves into the pharmacological, botanic, law enforcement, folkloric, and archaeological aspects of the flower that provides everything from a moving memorial to the dead (think Flanders Fields) to the seeds on morning bagels and the dulling of pain, but also looks at the pharmaceutical industry and even relates entertainment history. From the poet Samuel Taylor Coleridge to “The Bird,” jazz great Charlie Parker, to hip-hopper DJ Screw, Filan relates to us their close ties to the poppy and its mostly deleterious effects on their lives. There is a section on how to grow poppies : “Opium poppies are a popular garden plant, cherished for their hardiness and their spectacular blooms… As is often the case with Poppy, discretion is in order. Those sweet old ladies who appreciate your lovely flowers need not know they are oohing and aahing over Papaver somniferum.” And another on processing poppy sap to make one’s own products, along with warnings about the physical and psychic ills to follow if one allows Poppy to dominate, plus a guide to “getting clean” should the worst happen and the drug commandeer one’s life. An open-eyed, unbiased and realistic examination of the history of the poppy and its products, this book will appeal to a broad range of readers. They will not be disappointed.